I'm hoping that most of my list comes true. Like everyone else, I have to balance the summer fun times with worky work times. Happily, my work most often feels like play, I've just got my fair share of it happening this summer. Still, having my hands in varied enterprises makes for a rich, interesting life. If you're old like me, maybe you'll remember the REM album from 1986 - Lifes Rich Pageant. (Those rebels weren't fond of apostrophes so they left it off the title.) I've always loved that album and that sentiment. Life is a rich pageant, especially in summer. Everything alive with possibility and purpose. We seize those moments, hoping to hang on to them forever. 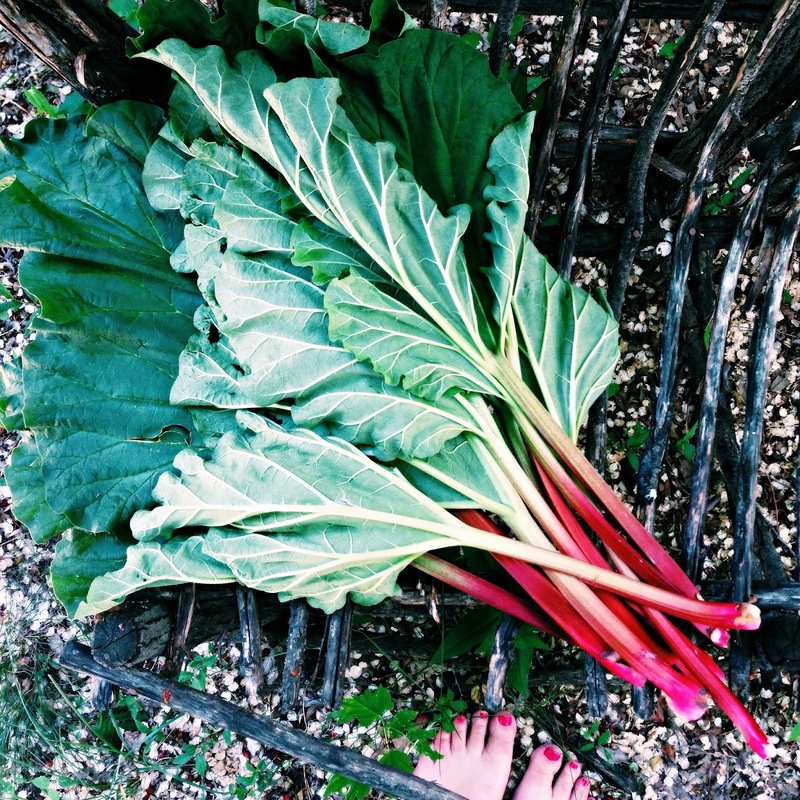 Padding around my yard, barefoot and happy (except for that time I stepped on a caterpillar) I picked rhubarb at the back of my garden. It's ruby red stalks (so pretty!) matched my freshly painted toes. Just look at those giant, poisonous leaves. The first pickings of the pie plant were chopped and stirred into cake. Yes, lets talk about this cake. 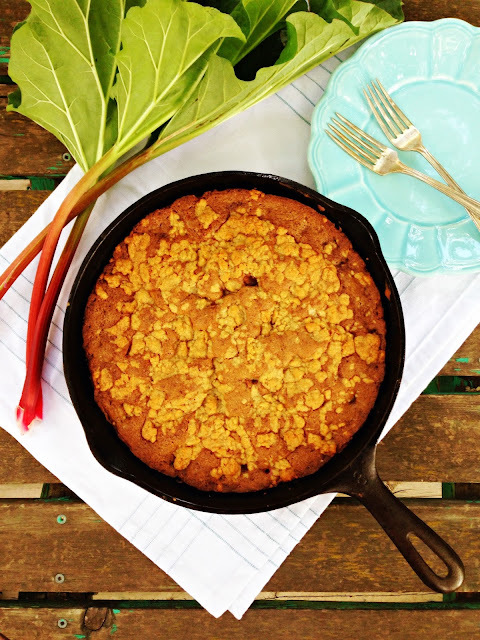 You need to have this skillet cake recipe in your back pocket. It comes together in under 10 minutes and bakes up like a dream in a cast iron skillet. 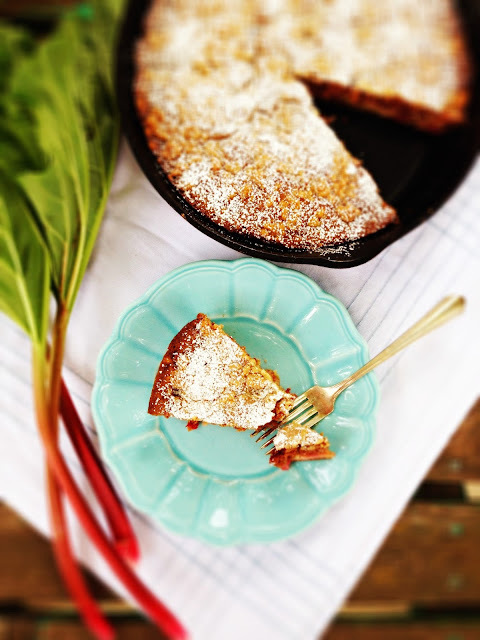 I know some of us are reluctant to turn the oven on when it's a real scorcher, but this cake is worth it. 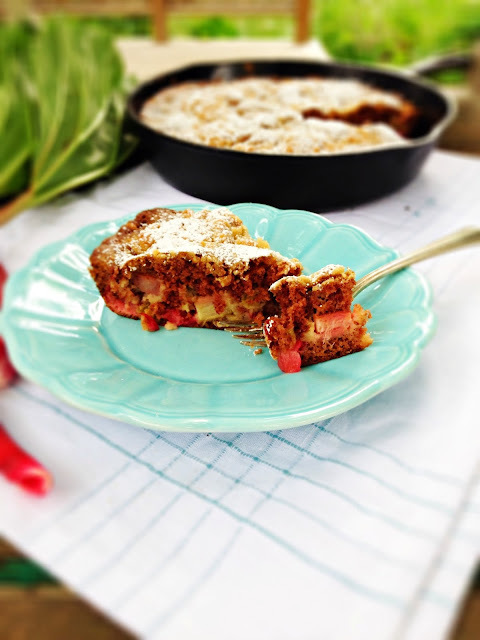 Light and spicy, tender and tart. And guess what? I stirred in some cooked lentil purée and you can't even tell. No one will be able to tell. I promise. 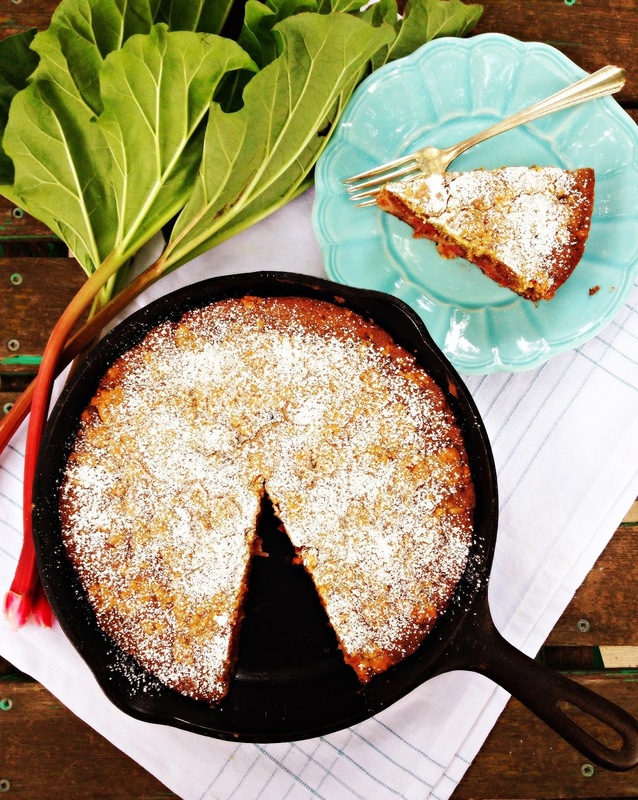 The lentil purée adds extra protein and fibre, so really, this cake is practically health food. Go ahead and have two pieces. Enjoy it for breakfast. Pack it along on picnics. Swap in other seasonal fruit as you like. Peaches and apricots would be lovely. Plums and nectarines, too. And to think, summer is just beginning. Hold on tight. ***To make lentil purée - combine 1 cup cooked green lentils and 1/4 cup water in a blender. Purée until smooth and the texture of canned pumpkin. If too dry, add 1 tbsp more water. 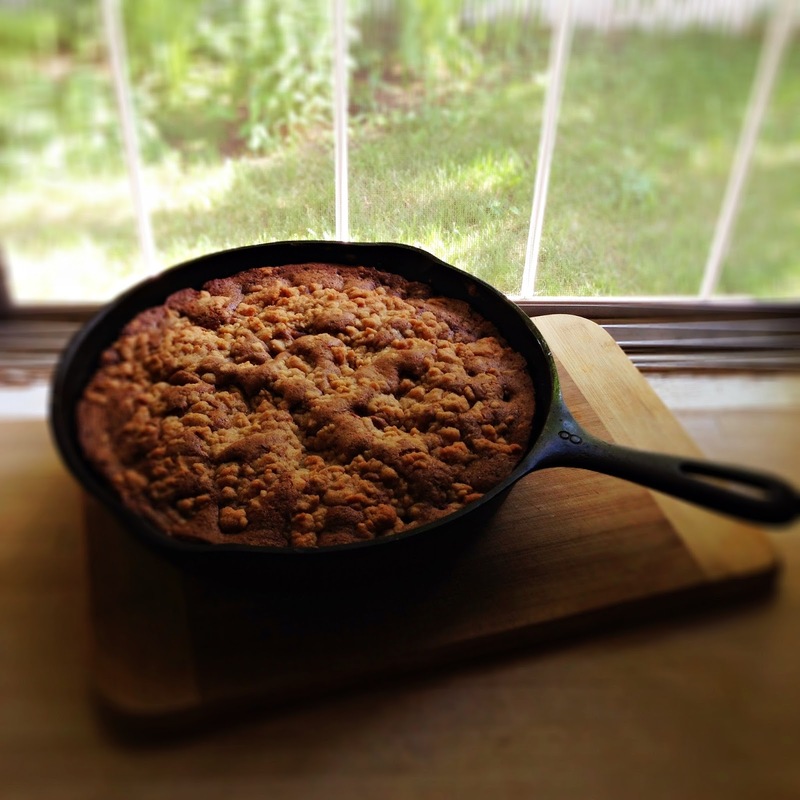 To make cake: preheat oven to 350*F. Grease a 9 inch cast iron skillet or baking dish with about 2 tbsp butter. In the bowl of a stand mixer, beat the sugar and butter on high for 2 minutes, scraping down sides. Beat in eggs and vanilla and beat for 3 minutes, scraping down sides. In a separate medium sized bowl, stir together flour, spices, baking soda and salt. Stir this into the butter mixture and beat on low just until incorporated. Use a rubber spatula to gently mix in rhubarb and lentil purée. Scrape into prepared pan and smooth the top. Scatter the streusel topping evenly over batter. Bake for 30 minutes. Let cool on a rack for about 20 minutes. Dust with powdered sugar before serving. Serves 6. To make streusel: in a medium bowl, add the butter, brown sugar and flour. Use your fingers to mix it all together, until all ingredients are incorporated and clumpy.